It’s been about three months since I first introduced project ‘Why Wait?’ and while I’d like to tell you a lot of physical progress has been made the reality is it’s still sitting at Taylor’d Customs in roughly the same spot it was mid summer. But that’s fine, the pyramids were not built in a day, nor were they built without plans, and in the time between then and now I’ve been doing a little planning. Though my vision for this truck is fairly standard, and I could just as easily squint my eyes at a few photos of other advanced design trucks and imagine, I wanted to get renders made because one of the things I enjoy most about any build log is watching a render become reality. Because I want this build to stick around for a while and not look like an “early/mid 2010 era build” ten years from now I’ve opted to visually keep things pretty classic. 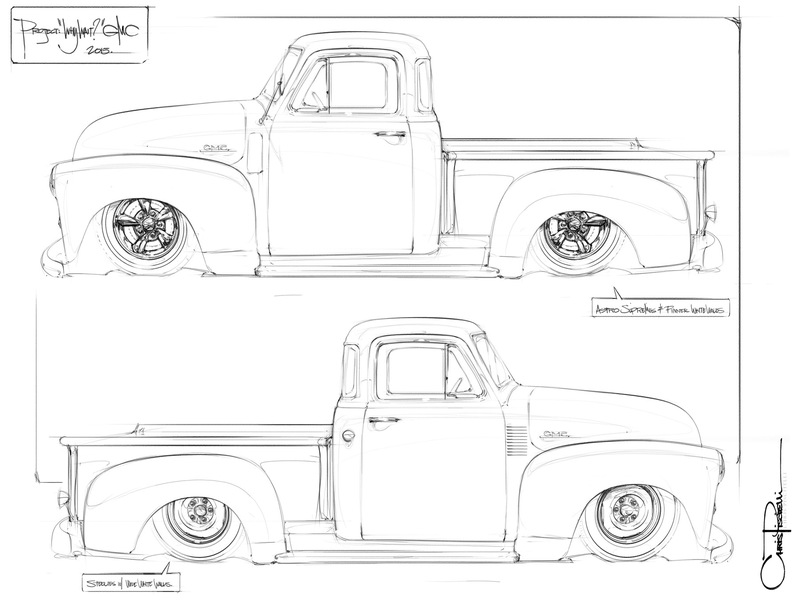 I reached out artist, designer, reader, and friend Chris Piscitelli and in short order he whipped up line drawings of my truck as a short bed laid on hubs and wide whites and Astro Supremes. 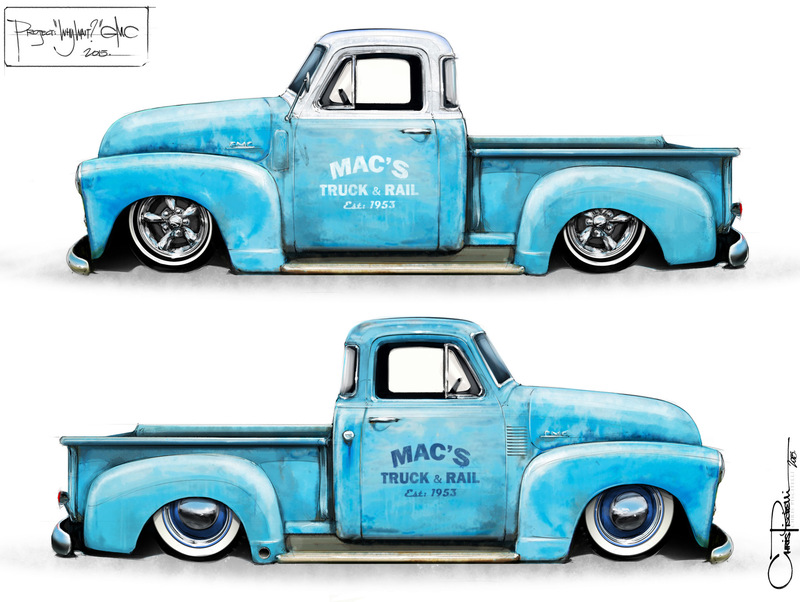 I then asked him to colour the truck in similar to the existing patina because for the foreseeable future the truck won’t see any gloss paint. After years of worrying about paint chips, door dings and the like I’m looking forward to a more maintenance free finish and quite frankly all the layers of paint tell a pretty neat untold story. I did however ask for two paint alterations, a white flaked roof, and fairly specific door art. The Mac’s Truck & Rail isn’t random. Mac was my wife’s fathers nickname and Macs is our son Ash’s middle name. He unfortunately passed away from cancer before my wife and I met but was a railway man by trade and a gear head through and through so we’ve decided to incorporate him into the build by spirit. Chris added a few details of his own here as well, namely the dark blue wheel colour for the steelies and the fender exit exhaust. In my head I was always heavily leaning towards the flaked roof and Astros option but my wife, who’s a bigger fan of the steel wheels, asked if we could see a render with he flaked roof from my preferred version and the wheels from hers versus a version with steelies with an untouched roof. Much to my surprise I actually liked her alternative option more than what I previously envisioned. One final revision of the door art back to white and we were just one minor detail away from the final render…. … and there it is the current final direction for Project Why Wait! Cool! Like the blue and white color scheme, nice drawings by Chris. Love it! Have you thought about a powerplant for this project yet? Also, there’s a grammar error in the Pyramids sentence. The “where” should be “were”. Power plant is the million dollar question! The straight six just might run but I’m not sure I want to keep it around for any length of time. They can look really, really, cool with the right dress up parts but they are really expensive to do much of anything with. I love the look of old V8s (Olds Rocket and Caddy motors) but they are typically up there in price. Exotic euro/Japanese swaps are out simply due to budget and my personal expertise.